A study presented last week at the largest annual U.S. HIV/AIDS conference offers a solution to this riddle: “repliclones,” populations of replicating cells with HIV’s genome nestled inside them. “It’s the most interesting presentation I’ve seen here,” says George Pavlakis, a retrovirologist at the National Cancer Institute in Frederick, Maryland. HIV-infected people who still have small amounts of virus in their blood despite being on ARVs frequently leave doctors “exasperated,” says virologist John Mellors of the University of Pittsburgh in Pennsylvania. Assuming that the virus has acquired resistance, they often change their patients’ drug regimens and order many extra tests. “Each of those creates anxiety and new side effects,” Mellors says. Moreover, these people may still have high enough viral loads to infect others. At the Conference on Retroviruses and Opportunistic Infections here, virologist Elias Halvas, who works in Mellors’s lab, described carefully analyzing viral isolates and blood cells from eight men and one woman who have had mysterious, persistent low-level viremia for an average of 3 years, despite taking ARVs. Halvas and co-workers noticed something curious. 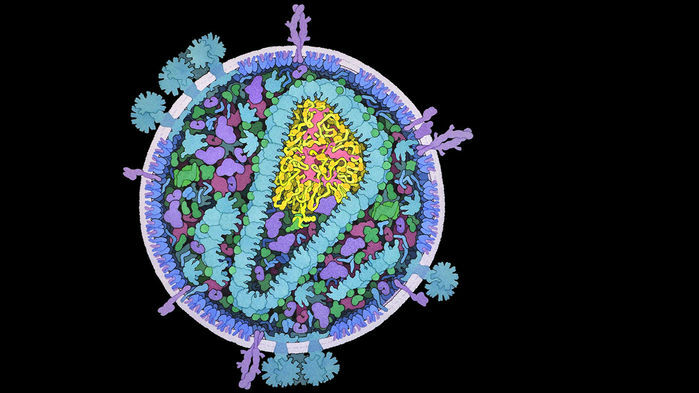 Normally, each time HIV infects a cell, the virus copies its RNA genome into a DNA version that integrates at a new spot among the cell’s chromosomes. But in each of these patients, all their infected cells had HIV integrated into the exact same chromosome region—a location that differed from person to person. The sequence of the HIV DNA taken from different cells in the same person was identical, too. Researchers have long known that HIV can make new copies of itself in two ways. In the basic replication cycle, the HIV DNA integrated in a chromosome creates new virions that bud from that cell, then infect other cells, acquiring mutations each time. ARVs block multiple steps in that process. In the second pathway, HIV essentially gets a free ride because it infects an immune cell that clones itself, making more cells that carry the viral genome. ARVs have no impact on that scenario, and the viral DNA ends up at the same chromosomal location in all progeny cells, without acquiring any new mutations. These clones can produce new virions themselves, but the ARVs taken by the patients derail new infections. Mellors’s team showed that this pathway single-handedly explains the low but persistent viral loads in these patients. Daniel Kuritzkes, an HIV/AIDS clinician at Brigham and Women’s Hospital in Boston, says the new data suggest doctors should not be alarmed by the low levels of virus in patients who say they are adhering to their treatment and have no obvious immune damage occurring. “It’s safe to assume that in the absence of increasing viremia there’s no need to change [ARVs],” says Kuritzkes, whose own lab reported a similar finding in an examination of a single patient. But the finding does cast doubt on a proposed approach to curing an infection: “kicking” cells that harbor HIV’s DNA in a latent, nonreplicating form so that they pump out new copies of the virus, setting themselves up for destruction. These repliclones are spitting out virions yet, for whatever reasons, they aren’t quickly self-destructing or being eliminated by immune responses, Mellors says. So something extra is needed to kill them. “If we can’t knock those guys out with our therapies, then kick and kill isn’t going to work,” he says. But another approach might: directly excising the persistent HIV DNA from a person’s chromosomes with the genome editor CRISPR. “It’s a science fiction idea that one day may be possible,” Pavlakis says. Now, he contends, the risks are too high that CRISPR’s Cas9 enzyme will make cuts in the wrong place and directing the editor to the appropriate cells isn’t simple. “CRISPR right now is not there,” he says. At the meeting, neurovirologist Tricia Burdo of Temple University in Philadelphia, Pennsylvania, described a first step: using the editor to excise at least some of the simian version of the AIDS virus, SIV, from the chromosomes of two monkeys. Earlier work has shown that CRISPR could excise HIV nestled inside the cells of mice engineered to have humanlike immune systems. In the new study, researchers infused a harmless adeno-associated virus carrying the genes for CRISPR’s targeted molecular scissors into the veins of two SIV-infected monkeys. The monkeys were on ARVs and had low levels of SIV. Necropsies of the treated animals showed that CRISPR had cut the SIV DNA in blood, spleen, lymph node, and lung cells, apparently disabling the virus. Blood from the CRISPR’d monkeys could not infect white blood cells, whereas blood from a control animal could. The group also found Cas9 in all 14 tissues studied, suggesting the delivery virus had spread through the body as intended. “The data show much stronger effects than have been seen before, so that’s a step in the right direction,” says John Coffin, a retrovirologist at a branch of Tufts University in Boston. Burdo says that in a future experiment, her team will take the CRISPR-treated monkeys off ARVs to see whether the virus rebounds. They also plan to transfer millions of blood cells from the CRISPR-treated monkeys to uninfected animals, another sensitive way to determine whether even trace amounts of intact SIV remain hidden. Burdo’s collaborator, Temple University neurovirologist Kamel Khalili, hopes to develop a human version of this CRISPR gene therapy. Khalili says his firm, Excision BioTherapeutics in Philadelphia, is seeking approval to launch trials of CRISPR excision of HIV in humans by the end of this year. Next Post Has a second person with HIV been cured?